I recently made a chocolate almond milk. It was so good - I was drinking it by the glass. But I also thought, hey this would be delicious in a smoothie! So I decided to make a Chocolate Milk Green Smoothie. This recipe has banana, berries, spinach, flax seed, nut butter, and of course, chocolate almond milk. If you can’t make the homemade chocolate milk, feel free to substitute with store-bought chocolate almond milk, or just use regular almond milk and add 1-2 tablespoons of cocoa powder to the smoothie (depending on how chocolatey you like). Any fresh berries will do. I used a combo of raspberries and blueberries, but add whatever you like best! 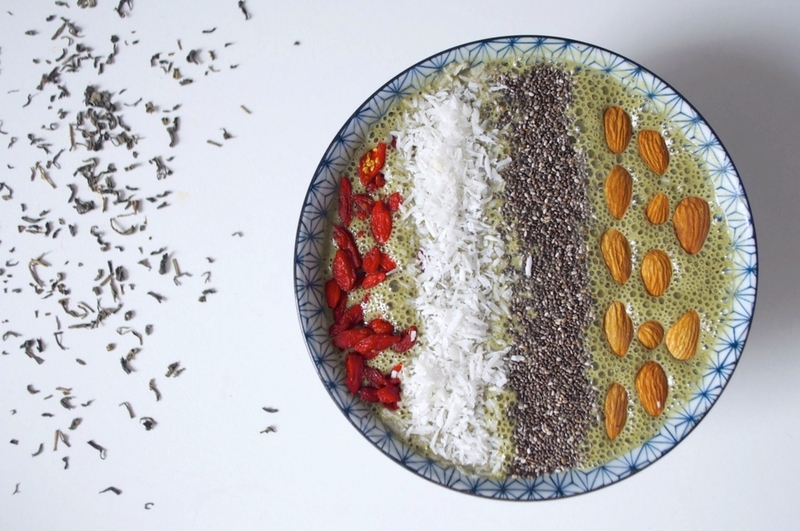 I topped the smoothie bowl with goji berries, coconut flakes, chia seeds, and raw almonds. Whatever you choose, make sure to have fun! Blend together the chocolate almond milk, spinach, berries, banana, almond butter, flax seeds, and ice until smooth. Top with whatever toppings you'd like! Today it was goji berries, coconut flakes, chia seeds, and almonds. Enjoy!